Will the Warriors spoil Jackson's return to Oakland? TheBodyGuard wrote: Stephen Jackson looks like a skinny 50 cent. Monta kinda looks like a black Gollum. jesus christ I noticed that the starting three could be brothers. LOL. bigstrads wrote: All this spread business...........I get the whole points total thing..........but then they say Ill win $100 if I put down $110!!!?? ?..........dont get it. Thanks man............think I get it. I thought it was me putting down $110, then only getting $100! .............so, just to be clear, I put down 110, I win, I get 100 plus I keep the 110 I put down? am I being weird? What about all the "lines" and "totals" and all that stuff.............they have Bobcats down as "-1.5"...........so that means they are going to win by more 1.5? and I say yes they are or not they are not? Is it meant to be confusing or is just me and our much simpler/straightforward way of betting on sports in England? Tarantism wrote: You guys, CJ will not play the 3 in this game. My personal prediction is that Mags will play the 3 and Tolliver or Vlad Rad will start at the 4 and guard Diaw. see that's what you think because it's logical right? I think we are going to see a replay of Jamison vs Kobe, with both Jack and Monta going off for 50 tonight. Both of these guys are going to be motivated to look better than the other. I just hope that Monta doesnt get too caught up and goes into complete ballhog mode. Im really looking forward to this game. It will be good to see Jack back in town. hey guys check it out, I got a cool pre-game video of Felton before the game. I don't know who allan and steve are, maybe they are plays they will run in the game. LMAO @ Praire Dog Felton. Good ****... pun intended. if Stephen Jackson gets booed, it's evidence that warrior fans aren't too bright. 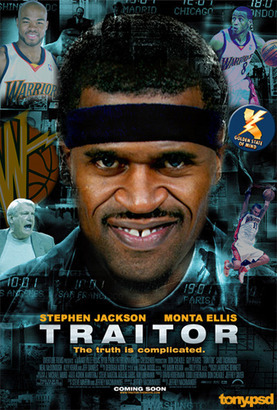 rockyBeli wrote: if Stephen Jackson gets booed, it's evidence that warrior fans aren't too bright. A 3 point chucking, awful percentage shooting, turnover MACHINE, phantom defense playing, Mullin backstabbing to get his extension, quitting on this team and wanting out as soon as he has his dollars kind of player returning here............should NOT get boo'ed? Question is how could anyone NOT boo him??? What are your reasons for why he shouldnt get boo'ed? come on, educate us "not very bright" fans who think he should be boo'ed? The only reason I could see that he would think that is because of Jackson's "I make love to pressure" persona. But seriously, BOO THIS !!!!!!!!!!!!!!!!!!! I was considering going just to boo. He hurt his own trade value, and our ability to get back something decent. Last edited by first off on Fri Jan 29, 2010 7:11 pm, edited 5 times in total.